Some of you might be wondering why you wouldn’t just get a regular pair of headphones and a traditional stand mic. The first reason is cost. Getting both of those items separately can easily run over $100. But on top of that, by combining mic and audio, you get an easy-to-use gadget that should work across of range of devices (PC, consoles, and phones), which is more than your average headphone plus stand mic combo can say. At their core, headsets are simple devices. They should feel good when you wear them, any extra functions or gimmicks should add to the overall product, not detract from it, and they absolutely need to sound good too—both for game audio, and for the people on the other end of voice chat. So those are exactly the criteria we’ll judge the headsets on: comfort, features, and audio quality. Now that we have the ground rules laid out, lets meet the competitors. For the battle, we’re checking out the Logitech G433, HyperX Cloud Alpha, Creative Sound BlasterX H7 Tournament Edition, Razer Kraken 7.1 v2, and the SteelSeries Arctis 5. Price wise, these cost between $90 and a penny under $100, so it’s a pretty level playing field to start. But from there, the headsets start to branch out with some going for simplicity while others have multiple audio connectors, customizable PC apps, or even RGB lights. But enough with the broad strokes, how do the headsets actually compare? The majority of these headphones play it straight when it comes to overall design, with the headsets of Razer, HyperX, and Creative featuring large, closed-back leather earcups held together by a padded adjustable band on top. The cans on the Razer Kraken are a little roomier than those on the other two, and their padding is slightly softer as well, but not by a huge margin. The Kraken 7.1 v2 is a good pick for PC-centric gamers, but a lack of additional audio connectors and wonky mic enhancement prevented them from beating out the Arctis 5. Meanwhile the Logitech G433 and the SteelSeries Arctis 5 both opt for cloth ear cups, which keep your ears from getting quite as sweaty. Yet the two companies’ different approaches result in wildly different levels of comfort. Despite the G433 being the only headset to offer two sets of interchangeable ear pads, both of them felt pretty bad. The default pads clad in mesh cloth are stiff, almost to the point of being scratchy, and felt more like cardboard than anything you’d actually want to put on your ears. The second set are made out a suede-like microfiber, and even though they feel slightly softer, the G433 was still by far the least comfortable headset of the five. I wanted to like the G433 because Logitech’s offers multiple ear pads and a range of color options, but the headset’s uncomfortable cups and weak audio quality makes them hard to recommend. On the flip side, the cloth-covered cans on the Arctis 5 (which SteelSeries calls AirWeave) are incredibly soft and light. The headset isn’t overly tight, the cups are deep enough to prevent pressing on the sides of your ears, and up top, there’s an adjustable elastic strap instead of a padded band that keeps the headset in place. Also, unlike the competition, the Arctis’ earcups have a tiny bit of airflow to so your ears don’t get too hot, which when combined with everything else, makes the Arctis 5 the most comfortable headset to wear. With each headset coming in at under $100, don’t expect the same kind of added functionality you might find in a $300 headset. None of the headsets we tested are wireless. For the most part, they are focused on comfort and decent audio—but they’re not without their tricks. HyperX’s no-frills approach means that aside from a detachable mic and in-line remote, there’s not much else going on with its entry. The Sound BlasterX H7 offers slightly more thanks to an adjustable audio app for PC gamers and virtual 7.1 surround sound. The Logitech G433 also adds in surround sound via a DAC you can plug into a PC. The Sound BlasterX H7 is a good all-around headset, but aside from its sturdy, reinforced cable, it didn’t stand out much from the other competitors. Yet the real fight comes down to the Razer Kraken and the SteelSeries Arctis 5, which are the only two headsets to offer retractable mics. They also take full advantage of PC integration to offer features such as customizable RGB lighting and 7.1 surround sound, as well as nifty software tricks like ambient noise reduction. Unfortunately for the Razer Kraken, actually turning on noise cancellation and ambient noise reduction made the microphone sound worse, not better. And unlike the Arctis 5, the Kraken doesn’t come with any on-board volume controls, which means you have to adjust everything using software of some sort. As for the Arctis 5—it kind of has everything. You can retract the mic to shut it off, or use the built-in volume dial and mute button to adjust volume. And if you’re on PC, you can even use the in-line remote to adjust the balance between game and chat audio, which is nice if you can’t hear your friends talking over the sound of explosions in the background. Really, the only feature the Arctis 5 doesn’t have is a dedicated DAC, which is found on SteelSeries’ more expensive headsets. Even though the HyperX Cloud Alpha have a tiny edge in audio quality, the sheer amount of features and fantastic comfort offered by SteelSeries’ headset was enough to give it the overall win. And it’s not like the Arctis 5 are a slouch in the audio department either. Then you have to account for connectivity. Razer gives you two options: you can either have headset with USB and 7.1 surround sound that works on the PC, or no surround sound, a 3.5mm plug, and the ability to use the headset on a console without an adapter. The Arctis 5 gives you surround sound and the ability to use the headset on a PC or with a console—no additional adapters required. When you factor that in, the Arctis 5 gets its second win. Sound quality was the tightest battle of the three. That is, aside from the G433, which sounded so bad when using the DAC on PC, I thought the headphones were broken. With a second second pair of G433 headphones, I ran into the exact same issue. While the G433 does sound somewhat better when plugged in using the 3.5mm jacks, it still doesn’t sound as full or rich as any of the other headsets. And when you plug in the G433's DAC, everything gets even worse. Typically, I try avoid using the word tinny to describe headset audio, so let me put it this way: With the G433, audio sounds like it’s bouncing around inside a metal cup. instead of trying to include a lot of fancy gimmicks, the Cloud Alpha goes for simplicity with a straightforward, but still comfortable design, and the best sounding mic and audio of the five. The Kraken headset had only a hint of muddiness in the bass I’ve encountered on some of Razer’s previous products. Otherwise, it sounded quite good, but that bass issue, plus the difficulties I encountered with some of the headset’s advanced mic functions, was enough to knock it out of the running. So it came down to the Sound BlasterX H7, the SteelSeries Arctis 5, and the HyperX Cloud Alpha. To really dive deep into their audio while gaming, I took each headset out for multiple 2-hour gaming sessions, focusing primarily on Overwatch because of its top-notch sound design. 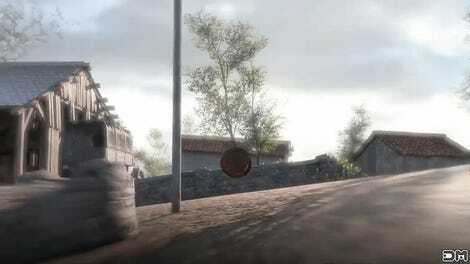 In particular I was looking to see whether I could pick out individual details like the sound of footsteps running up from behind or the whoosh of an enemy Tracer blinking around in the distance. Due to the ability to customize EQ and other audio settings in its app, the Sound BlasterX H7 and SteelSeries Arctis 5 delivered more than proficient audio. However, the Arctis 5's looser fit, meant that a tiny bit of ambient noise sometimes leaked in, which made softer sounds harder to hear. The Sound BlasterX H7 on the other hand suffered from flat response in the highs and midtones. In the end, the real star was the HyperX Cloud Alpha, which proved you don’t need gimmicks or fancy tricks to make things sound good. This headset was the only one without a dedicated PC app. Instead, the Cloud Alpha relied on large dual-chamber drivers, a closed-back design, and tight fitting ear cups to deliver straightforward but still high-quality sound. Its mic was equally proficient, which my friends on Discord agreed sounded the richest and most accurate compared to my Blue Yeti stand mic, which on its own costs more than any of the headsets in our battle. Meanwhile the fuzzy pop filter and built-in noise-canceling mic helped tune out unwanted sounds without screwing around with my voice. I really don’t know what went wrong in the making of the Logitech G433—but it’s simply too janky to be a contender. The G433 even came came with the most extra “goodies” in the box (cloth carrying case, a second set of ear pads, and three different audio connectors), but its fit and sound was too disappointing. 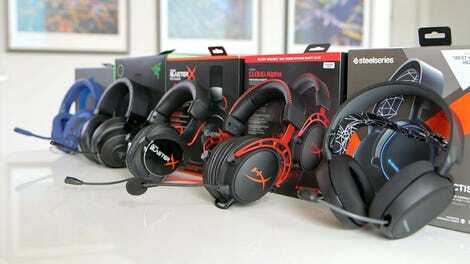 The Razer Kraken, Sound Blaster H7, and HyperX Cloud Alpha headsets all had their strengths. I especially like how HyperX managed to deliver high-quality audio without any tricks or gimmicks. The Cloud Alpha is the epitome of a solid design and good sound rolled into a simple package, and if I had to choose it would probably be my runner-up. But when it comes to picking an overall winner, the SteelSeries Arctis 5 headset stands out. Its outstanding comfort, wealth of features, and top-tier audio propelled it ahead of everything else. SteelSeries’ headset consistently exceeded expectations, and after all the testing was done, it was the pair that I found myself gravitating to when it was time to play some games. If you’re going to buy a headset priced under $100, the Arctis 5 is your best bet.